What does it take to build a perfect closet? Truthfully, not that much. Within a materialistic society, we often believe more is better. In reality, when we ask ourselves, “Why do I have nothing to wear?” the fact of the matter is, you have too many options and perhaps not enough staples. That's why Emily has been chronicling her experience with creating a capsule wardrobe. Everyone has a different day-to-day and that may dictate the details of your wardrobe. But one thing remains the same: we all benefit from the basics. I’ve rounded up a few items that are worth the investment and worthy of a place in your closet. And when at all feasible, it's best to buy products that are as good for Mother Earth as they are for defining your style. With that in mind, we've included eco-friendly, sustainable options for each item as well. Jeans are a powerful asset to any closet. The key is to find your pair; the ones that fit your body like a glove and flatter you better than any compliment you’ve ever received. Some of the best brands out there are Paige, Joe’s, Levi’s, J. Brand, and Madewell. An environmentally better option? Patagonia! The outdoorsy brand launched their new way of making denim in 2015 with this video, making their jeans with 84% less water, 30% less energy, and 25% less CO2 than conventional jeans. An essential to everyone’s closet, the basic tee can be dressed up or down. A white, black, and gray option will get you very far. Check the material to make sure it’s going to last you the long haul. Want a eco-friendly tee? Check out Threads for Thought. Their tees are organic cotton and made from 100% recycled polyester. Whether you like to actually workout or not (let’s face it, we can wear workout clothes everyday without stepping foot into a gym), these cool pieces are necessary to have. You never know when the opportunity will present itself to meet your coworkers at a spin class or go hiking on a date. Outdoor Voices has been taking the activewear industry by storm with a lot of their clothing being made from recycled polyester and recycled water bottles. And, it's a female-founded company, which is always a win in our book. I never realized the power of a favorite jacket until I invested in my own leather jacket last year. Talk about going from 0-100! Jackets are not only a layering piece but can also define an outfit. If you need a quick fix to look put together, slip on a jacket or coat that makes you feel empowered. There are so many eco-friendly options for various kinds of outerwear. 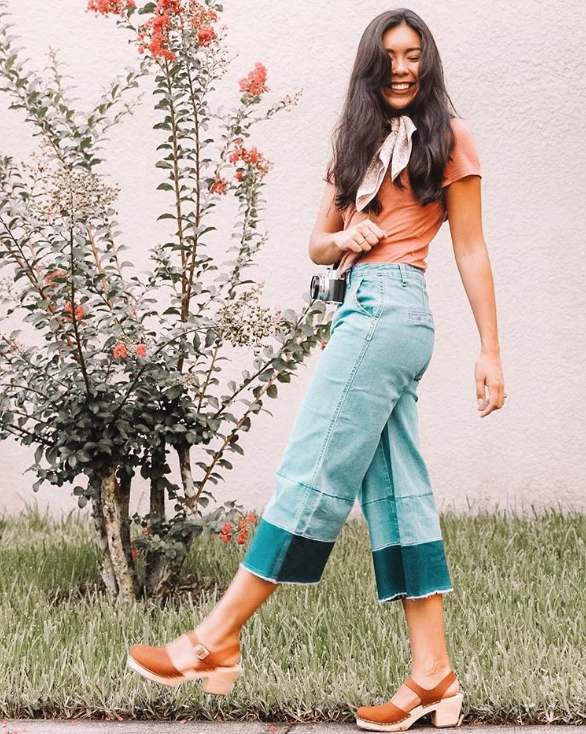 Some of our favorites are Swellas, who use upcycled fabrics and donate jackets to children in need, United by Blue, who removes one pound of trash from our world's oceans and waterways for every product sold, and prAna, who uses sustainably-sourced materials for all of their products. I’m living for that fact that sneakers are making a major comeback, and not just your running purposes. Brands like Adidas and Vans have become super popular in making the sneaker for everyday wear. For working out sake, as a former cross country runner and still active runner, the right sneaker is essential for my success in my workouts. If you’re looking for great running shoes, check out Brooks, Asics, and Saucony. If you want an eco-friendly option, Adidas, Allbirds, and The People’s Movement have great options as well. Do you have favorite eco-friendly style alternatives? Share with us in the comments!